We would like to have seen fresh eyes at the top of GE rather than a lifetime insider. We do not think that some sort of scalpel based surgery is needed – we are looking for the meat cleaver approach and are concerned that an insider will struggle with straying that far outside the box. There are complex companies and there are overconfident companies – these for the most part tend to be one and the same – there are no complex companies with conservative or even realistic managements based on our analysis. Overconfidence, likely influenced by the ever-changing complexity of the portfolio, has resulted in a company which continues to make poor capital allocations decisions. The M&A revolving door is seen as a core competence and a driver of value – it is not, and it is time for the company to take a break – assess what it has – what the potential of each business might be and how to get there. We would start by exiting Energy completely as part of the Baker Hughes deal – for reasons we will elaborate on further – we think the commodity risk will be a distraction. We would then separate the Healthcare business, through a sale or spin. The remainder of the business could probably benefit from further separation, but it will likely be easier to see what the best next steps are once the other pieces are gone. The “internet and connectivity” argument is probably correct, but the opportunity is not lost to any of the businesses if they are run independently. Unlikely that it is going to be important for a GE MRI machine to talk to a steam turbine, and even if there was a reason to do so they would not need to belong to the same company. GE’s deal flow and its accounting around working capital confuses investors and maybe it is like the secret formula at Coke: only a few are allowed to know what is really going on! Running it as one big, hard to understand conglomerate clearly has not worked – time for something different. We think breaking the business up will identify billions in stranded costs which will in turn drive earnings growth at each constituent part. If Mr. Flannery adopts an incremental approach we suspect he will have a very short tenure. Mr. Flannery needs to start his tenure at GE with an open and candid declaration of the state of play. This will likely involve a rebase of earnings and the start of a process to put some realistic expectations under each business and a most likely path to improvement. The problem is that we believe that this is an almost impossible task. The complexity of the company – not just the business lines themselves, but also the revolving door of deals, clearly lead to a poor understanding of what the overall platform can deliver – as demonstrated by chronic optimism within the management team leading to disappointing results, poor capital allocation and a cycle of behavior that is going to be hard to change incrementally. We have already seen one senior GE executive resign because he did not get the top job and feels he is ready to run a business – evidence would suggest that the GE management team does not know how to run a business – they may be good at their part, but perhaps not given the continuous disappointments, and the optimism that clearly did not sit with Mr. Immelt and likely runs deep. There is likely a deep rooted cultural issue at GE that genuinely believes that the strategy of the last 10 years has been the right one and that they have just been unlucky, or that unpredictable macro events have caused the problem and not the strategy. If Mr. Flannery’s first move as CEO is to talk about a long, thorough review of the business and a report back in 6-12 months it is likely that the stock will continue its decline, especially on what we expect to be another round of negative revisions. If instead, he separated the Energy business completely and states that he also plans to separate Healthcare, in combination with a major cost initiative, he will get people to listen. We believe that GE gets broken up – either by Mr. Flannery or by someone else – and on that basis, with the cost opportunities that should accompany a break-up, aggregate earnings can climb well above $2.00 per share and the stock can hit $40 per share. With a “steady as she goes” strategy, $20 is more likely than $40. 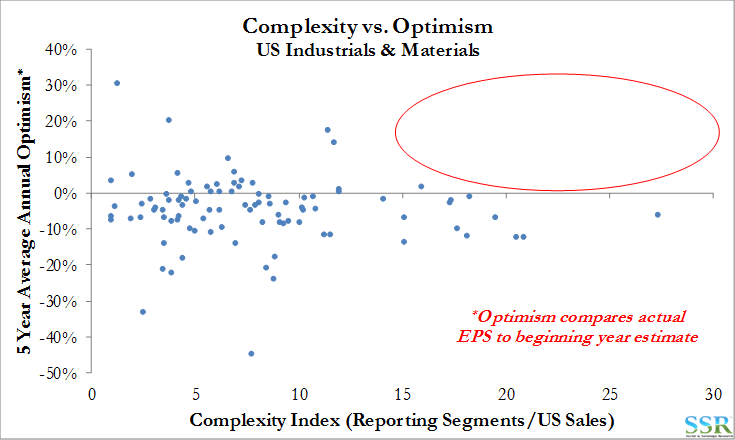 We define optimism as the degree to which companies consistently miss their own guidance – we are assuming that January 1st estimates are a function of company explicit or implicit guidance – missing once could be for reasons completely outside of the company’s control but missing consistently suggests a lack of realism – or simply a company over-enamored with its portfolio and how it can grow. How many times have you heard a company say “we are going to grow market share while maintaining margins”; in Industrials and Materials, unlike Healthcare and Tech, no-one has the R&D edge to achieve that for very long. GE’s optimism tops the pile on a five year view as Mr. Immelt has tried to articulate a path that the company could not walk. In our more comprehensive work on optimism we show the results summarized in Exhibit 3. Optimists underperform their more conservative peers on any metric you choose. This is clearly the case with GE. There are no conservative complex companies – Exhibit 4! But what drives the other – do optimists conclude that thy can successfully run more and more complex portfolios/stories, or are complex businesses hard to get a real read on and lead to overconfidence, especially if each business leader is talking up his or her patch because they do not want to be the next divestment. GE has been a revolving door for deals – another issue – and business managers might be persuaded to talk up their businesses to stay out of the lagging quartile or quintile. We have shown that optimistic managers underperform and if there are no complex businesses without optimistic management – then GE has no choice – become less complex. 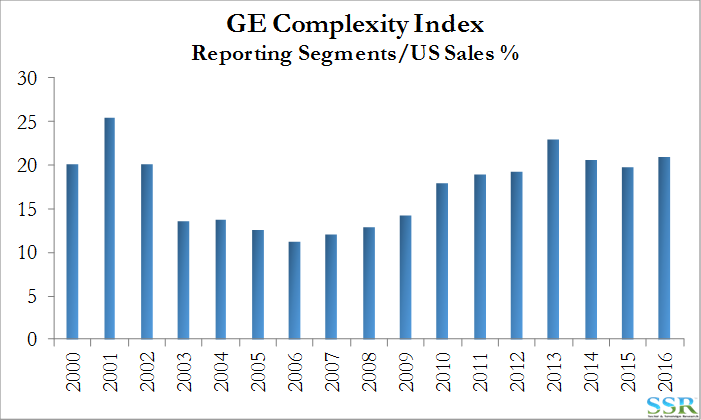 GE is the most complex of the conglomerates based on our definition of the metric – Exhibit 5. It is certainly not the most complex of companies in the Industrials and Materials space and we think that honor will soon fall to the merged Clariant/Huntsman – see research. As shown in the Exhibit 6, the M&A program has changed the complexity index almost annually and sometimes significantly. So, a complex company with complexity around the level of complexity! As our primary focus is on our investment management clients we would question how anyone can model the company with enough confidence to want own it. But we have also run and built businesses, albeit much smaller, and we feel qualified to ask the obvious question – which is how on earth can you manage something effectively and with this many moving parts and drive value from every corner. The simple answer is that you can’t. 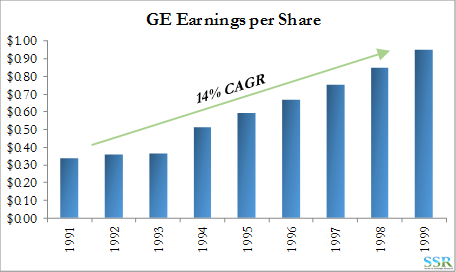 Going back to the data in Exhibit 1, if we summarize GE’s value destruction and then compare with the other three large conglomerates we show how far off the mark GE has been. 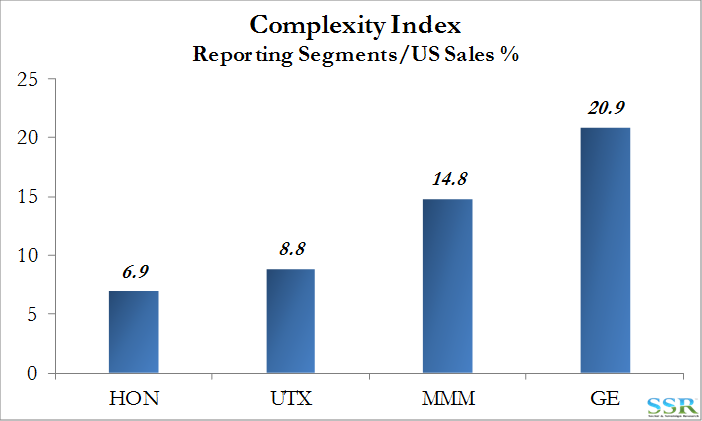 MMM is the only one to create more value than it has spent, but both HON and UTX have not done too badly – note that companies with a positive net on this analysis in Industrials and Materials are hard to find. The GE deal machine worked in the 1990s because all you needed to know was that earnings would grow at 10+% per annum – Exhibit 8. 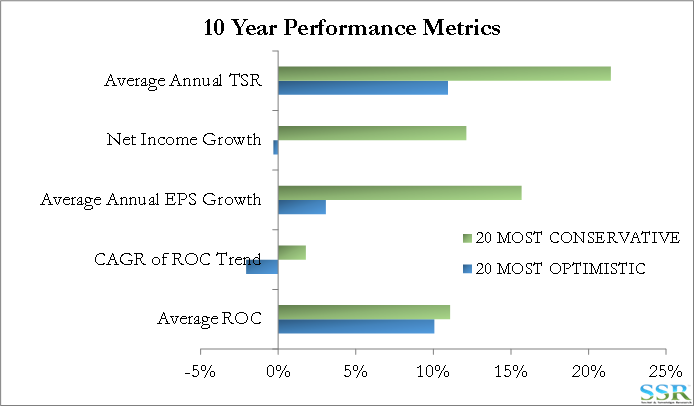 Earnings growth continued into the following decade but GE’s relative multiple had been dragged up with the tech bubble and while earnings improved, the decline in relative multiple did not help shareholder returns – Exhibit 9. 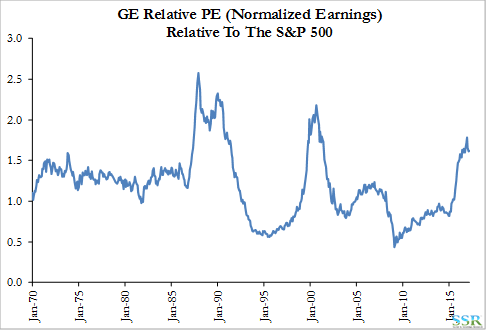 GE rallied again as part of the financial bubble, but then all of the wheels came off! The recent rise in multiple in Exhibit 9 appears to be the market again giving the company the benefit of the doubt around improving earnings – suggesting that the stock is not without its risk if there is a broad further loss of confidence. We firmly believe that the portfolio revolving door is part of the problem and as shown in Exhibit 10 it dwarfs what other conglomerates are doing. The result is an additional degree of uncertainty around cash flows for a company that already has complex working capital allocations and flows stemming from some of the very large – long lead time – engineering projects in the power and engine businesses. 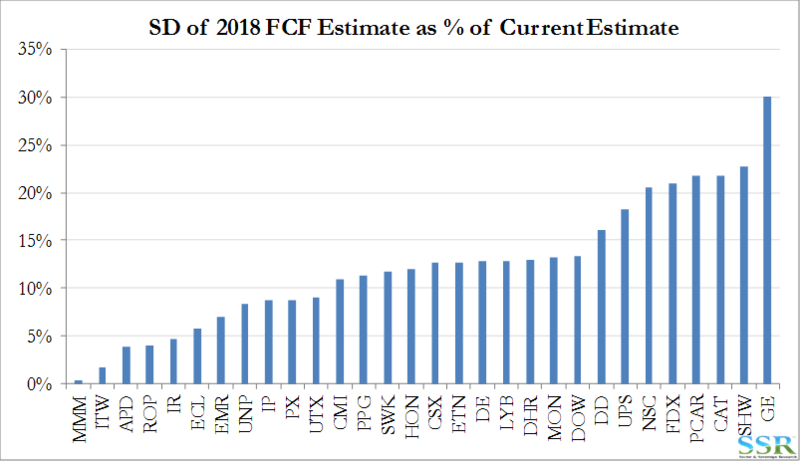 As shown in Exhibit 11, GE has the widest range of uncertainty in forward cash flow estimates. This is in part due to more limited coverage and a smaller sample set, but company guidance is poor and its track record of accuracy is very low. GE/Baker Hughes is a great idea and could be a great company, but it’s share price will inevitably be impacted by the commodity price – Exhibit 12. The new CEO could be doing the best job in the world with the rest of portfolio but in a volatile oil environment investors will be drawn to this aspect and the multiple of the whole company will likely be negatively impacted. 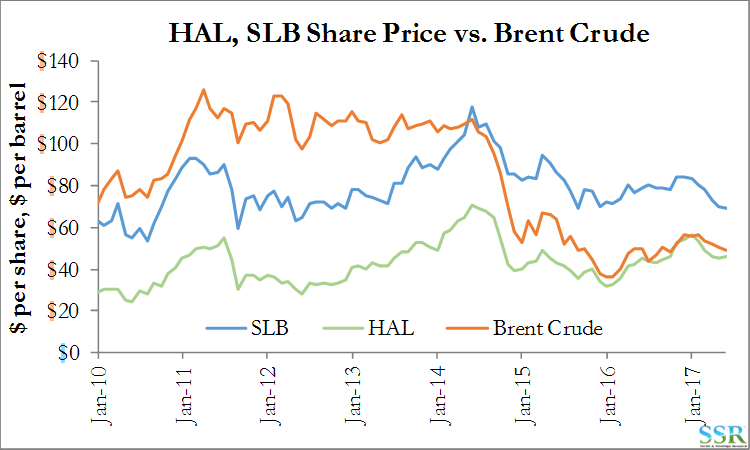 GE/Baker Hughes could and should be a great oil services investment. This should be a relatively easy move. Combined with the separation of energy this could unlock billions of stranded costs giving EPS opportunities for both the healthcare company and legacy GE. Stop: take stock of where the company then sits – costs – integration etc. Then move again – maybe separate transport and power from one another, but much easier to evaluate with the distraction of the other pieces gone.